If you have recently committed to a big project, have a baby on the way and are wondering how you will survive both, this post is for you. I can only imagine how many people will tell you that this is impossible, stupid, or both. Or, “adventurous” if they are being polite. They are right. And that shouldn’t stop you. If you have your heart set on creating something while welcoming new life into your home, go for it. 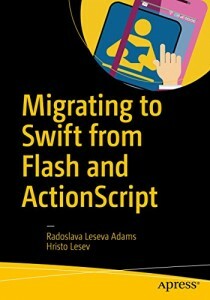 When the opportunity came to partner with Apress for writing “Migrating to Swift from Flash and ActionScript”, I was eight months pregnant. My business partner Hristo and I weren’t sure how it would work with me abandoning my duties for a while, never mind if we could add a technical book in the mix. Having emerged at the other side with a book in hand, and more or less on schedule, I would like to share the surprises I personally encountered along the way. 1. You don’t need to sacrifice sleep. 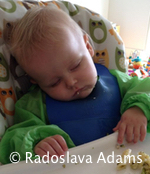 With a baby in the house, you are chronically sleep-deprived – that’s a given. Writing a book doesn’t need to cost you a lot more sleep than you are already lacking, though. Some of the time when you have to stay awake can be used for writing. As it turned out, nursing didn’t work out for us and we had to make different arrangements to feed the baby. I’m aware that most of our readers are guys and probably not that interested in the details, so I’ll just say that there were quite a few hours in the day (and night), when I needed to be awake, even if my daughter was sleeping. 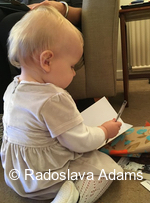 So I spent some of that time on writing – typically in the early morning before my husband went to work and if I could still think straight, late in the evening when he was back from work and could take on parental duties. However, if you are a new mum and need support with an infant who refuses to nurse, drop me a line or leave a comment below. I want to hear what you are going through and would be happy to share my experience and what worked for us. 2. You don’t need to give up fitness. Writing on a deadline is notorious for causing authors to neglect or abandon their fitness routine. Although I’m not a fitness fanatic, working out has always been non-negotiable for me. I was worried I would have to give it up – what with a newborn and a book under way. While on a normal writing schedule you may feel like you have to spend all your waking minutes in front of the computer, working long hours when you have a newborn is impossible. And you have the perfect prop for weight training (though a bit smelly at times). 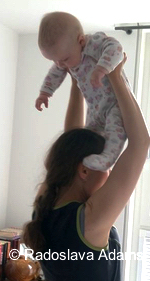 The baby’s weight increases gradually week by week and you can perform lots of exercises together: squats, lunges, bench and shoulder presses, walking up and down stairs… Best of all: she can be quite cooperative. At least until her opinions start opposing yours on the matter – for us that happened around seven months. 3. You can write your way out of depression. Postnatal depression affects many new parents and roughly one in ten mothers go through it within a year of giving birth. I happened to be one of those “one in ten”. It hit me in full swing a month after my daughter was born (being unable to nurse her was kind of a trigger). I was in a dark place, felt hopeless, had suicidal thoughts and was baffled by how I could receive such a beautiful gift and be so miserable at the same time. “When you’re going through hell, keep going…” the famous quote goes (1*). Having a writing schedule got me to put one foot in front of the other. And making progress brought a sense of having control over my life, which eventually (many months later) helped me claw my way out of depression. (1*) Usually attributed to Winston Churchill, but most probably by an anonymous author, according to quoteinvestogator.com. 4. You don’t have to live on caffeine. This was one of the bigger surprises for me. Although I had managed to give up coffee leading up to pregnancy (during an IVF round), I suspected I would need it by the buckets just to unblur my gaze in the morning, when I got up for those early writing sessions. Nah. The mix of excitement and stress did a much better job, I found. 5. You can get more done in 16 hours per week than in 48. 6. Help in the house is good. But doesn’t help with writing. When my mother flew over to give us a hand, I thought that the month she stayed with us would be the time I would get the bulk of the writing done. 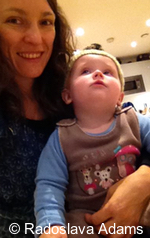 I was so wrong… In reality, apart from being glued to my daughter out of necessity for the first seven weeks, I also found it really hard to be next door and focus on writing while my mum looked after her. The instinctual need to be with your little one every minute of every hour, especially at the start, can be very overpowering. I was dreading the moment my mum would leave us, as I wasn’t sure how we could fit looking after a baby, doing chores, my husband’s full-time job and my writing schedule. We eventually figured out a routine, where my husband would be on duty in the early mornings and a good part of the weekends, so I could write. My hat goes off to all of you out there who do all that and look after more than one kid. I honestly don’t know how you do it. 7. “Baby brain” is irrelevant. You may have seen this term being brandished by pregnant women to excuse their absent-mindedness. “Baby brain” is the fog that allegedly descends on your mind during pregnancy and stays with you long after you’ve had the baby. While scientists still debate whether it is real or not, I can tell you I experienced it first hand. I would forget where I was going, get in elevators and wait, instead of pushing a button, get on the wrong train despite loud announcements at the station. Repeatedly. But when it came to writing, my focus was laser-sharp. Hormones are a powerful thing. Must be all that adrenaline from having a deadline and the excitement of creating something. The bad and the ugly? In case the list above makes the combination of writing a book and looking after a baby arrogantly easy-breezy, let me tell you some of the downsides. I certainly cried a lot and ranted to my husband. In the rare moments we saw each other, that is. Our life started closely resembling Sergeant Colon’s “thirty years of happy marriage” (2*). With that, I would like to thank my husband for the many hats he wore during this project. He would change a nappy, then read through a rough chapter draft and give me his take on it. Thanks to both sets of grandparents for looking after us at times! And to Hristo for holding up his end of the deal! 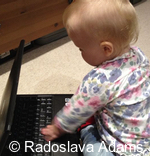 Writing a book on maternity leave taught me a lot of things, most of all that it can be done. It was invigorating (though exhausting) to go full throttle on a single project and watch my daughter and the book grow up together. 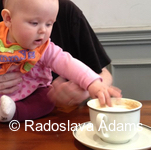 Now that I’m in it for the long haul, I find working and parenting tricky to mix. To all our readers who juggle kids and making a living, whether in a day job or your own business: what’s your secret? Leave us a comment below. 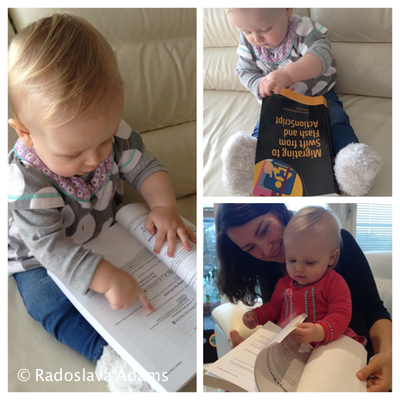 Radoslava has spent the last 18 years programming in Delphi, C++, C#, Java, Objective-C, ActionScript and, most recently, Swift. A former boss affectionately called her ‘pit bull’, a metaphor for how she won’t let go of a bug or a problem until it’s resolved, he explained. We believe him. Superpower: Somersaulting between platforms and programming languages. Likes: C++. Scott Meyers. Hot water bottles. Dislikes: Wordy manuals. Having to click more than once to do a build. 2. What are Adobe AIR Native Extensions? 3. 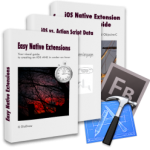 How does an AIR Native extension fit in your app? 4. What goes into an AIR Native Extension?